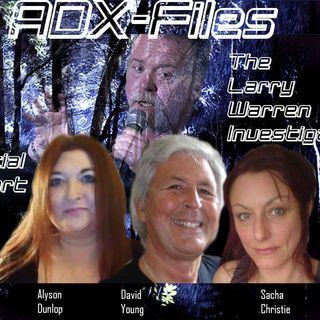 Sacha Christie and David Young join Alyson Dunlop for this ADX-Files 2 hour special, featuring audio recordings of the inconsistencies in Larry Warren's testimonies over the years, as well as some of his outlandish claims. For a comprehensive account of Warrens trip to Germany refer to LAEG. I have already included the excerpt in the blog. I willpost reminders. I'm sure they'll have some twist. It's all they've done. Twist everything to new people, new show hosts, old adversaries. As if I even care about whatever they're all.doing. They throw themselves into this and then start crying about how I'm.attacking them. I talk about them, talking about me and they scream like babies at each other while pointing at me. I really can't feel anything they say because they're meaningless to me, in my life they're a bit of text on a screen with the occasional video interview performance. They are all performers. I think the evidence is pretty conclusive. Not sure they'll be able to wriggle out of it this time. Well there you have it... see what they do to twist this now. The closing theme is still Mozart's Requiem. I just divided it into 3 parts. Thank you to EVERYONE who has helped us over the past year or so. Sacha, did you get that policewoman's name? Ill send it to you Alyson. David, what's the email address you have for your cop shop? Yeh. You did. LOL! I had a wee outburst about it. I know someone who knew Stan the Man and DID play with him.